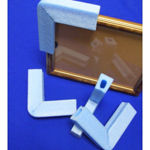 Foam corners suitable for protecting the corners of fragile items from knocks and scrapes. Ideal for sheets of glass / plastic, thin screens etc. Will fit items up to 10mm wide.